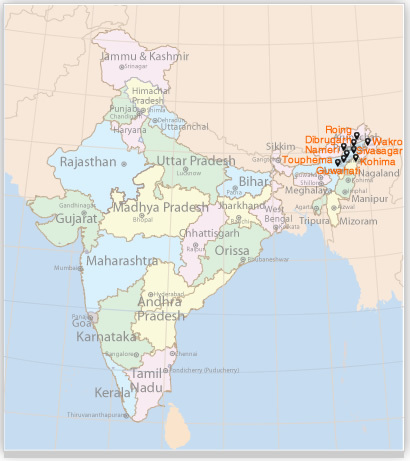 Bordering China-Tibet, Bangladesh, Bhutan and Burma, the north-easternmost corner of India is an area little travelled by tourists. The area abounds with picturesque tea and rice plantations, some breathtaking mountain scenery and magnificent National Parks. Visits to Tibeto-Burman tribal villages and Buddhist Gompas offer a rare glimpse into an area vastly different from what we normally expect of India - in many ways this really is a different country. 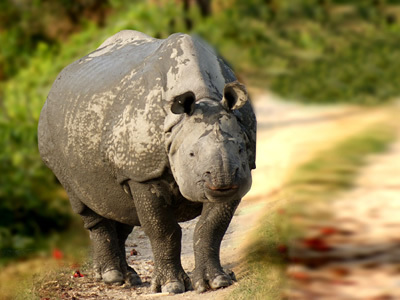 At Kaziranga National Park you will have a very good chance of seeing some of the 1800 one-horned rhinos which live there- this is about two thirds of the world's total rhinoceros population. 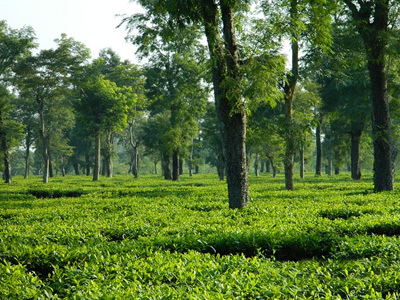 Also enjoying stay in the famous tea gardens of Assam in the beautiful Chang bunglows. Arrive in Dibrugarh by flight from Delhi where you'll be met and transferred 30 minutes to Chang Bungalows in the midst of a tea garden. In the evening enjoy a dance performance by an ethnic Assamese dance group on the bungalow lawns. 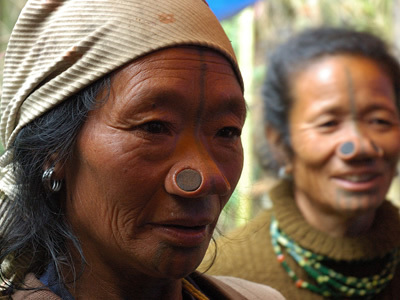 Drive 5 hours to Roing in the Debang valley of Arunachal Pradesh and after lunch meet the Mishmi tribes who inhabit this region. Early morning drive to Mayodia Pass (55kms/90 minutes) - a unique pass situated at an altitude of 7000ft amidst lofty hills, lush green forests and breathtaking landscapes. Return to Roing and visit the local village. Drive 4 hours to Tezu and visit the local museum and emporium, before proceeding to Wakro (a further 2 hours) Enroute visit Parasuramkund - a pilgrimage site where thousands of devotees come every year during Makar Sankranti to take a dip in the sacred Lohit River. Wakro, set in a valley nearly 2000 metres above sea level, is the homeland of the Mishmis, a Mongoliod tribe of Tibeto-Burmese origin. 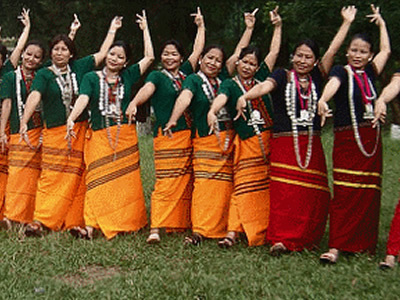 Each group has a distinct dialect - the 3 major Mishmi groups are Idus Tarons and Kaman. This is a very rich culture and one of the Mishmis' key beliefs is that any day of the year is auspicious for a ceremony if the provisions for it are present! On these days animals are sacrificed. Mishmis are truly an animist people. 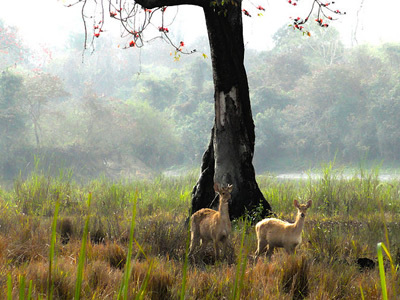 Day excursion to visit the Lama and Chakma villages situated on the outer fringes of Namdapha National Park. A further day of village visits and interaction with Mishmi villagers, with options to visit schools and markets. Drive to Namsai, the home of Khampti who migrated from what is now Thailand in the 13th century. 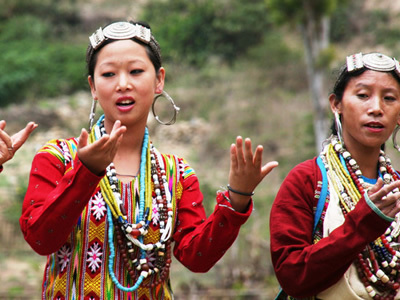 Visit Impong village, and learn about the Khampti culture and also visit the Buddhist Gompa which is considered to be the largest of its kind in the north-east. Drive back to Dibrugarh. Tour a tea estate to learn all about tea - its origin, how it is grown, all about tea tasting and its quality (if you are tea aficionados, this will be heavenly. And if you're not, you may leave with a new appreciation of the world's favourite beverage!). Later visit a weaving center to see the traditional looms and the weaving of Assamese silk textiles in Assam which are famous all over the world. Evening free. 2 hour drive to Sivasagar to visit the Ahom monuments and temples which encompass 6 centuries of history of the Ahom Dynasty which ruled Assam. After lunch drive to Kaziranga National Park (140km / 3h). 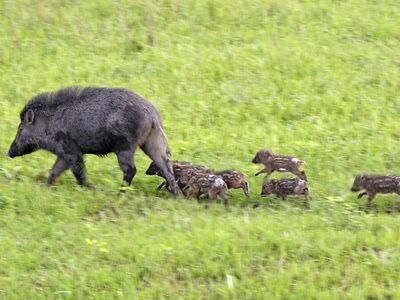 Home to 75% of the global population of Indian one-horned rhinoceros, Kaziranga is also home to Asiatic water buffalo, elephant, tiger, leopard, and 4 types of deer- swamp, barking, hog and Sambar. More than 400 species of birds are found in the park. 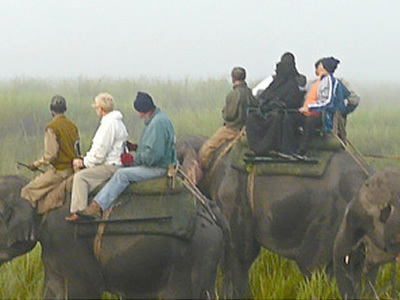 Start the day with an early morning elephant safari in the central range of the park followed by a jeep safari after breakfast to the western range of the park. In the afternoon visit the eastern range of the park by jeep. Overnight at Wild Grass Resort (note- you may like to have more than one complete day at Kaziranga to further enjoy this wonderful place). 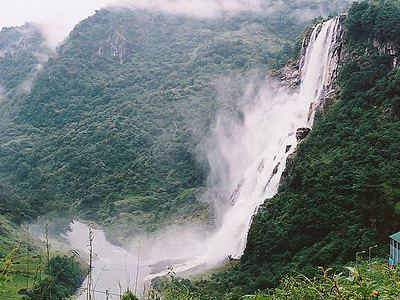 Drive to Tuophema home of the northern Angami tribe, situated deep in the central Naga Hills. 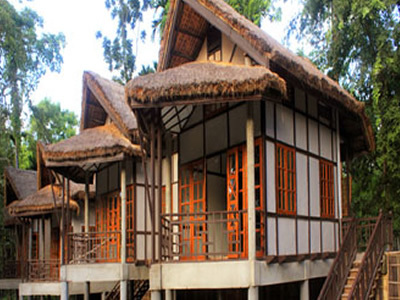 Here you will stay in a (tastefully) recreated 'village resort'- part of a unique initiative in community tourism with all the ingredients of a traditional Angami Naga village. Drive one hour to Kohima and take a walking tour around the Garrison Hill area to revisit the Battle of Kohima, a pivotal battle in the later part of World War II when this area was a major front in the Japanese push towards India. The tour culminates at the 2nd World War Cemetery, where the famous Battle of Tennis Court took place. 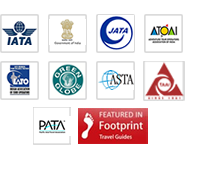 Option to visit the State Museum and the handloom and handicraft emporium, which is a treasure house of traditional weaves, along with the souvenir shops. illage visits to see the Angami people who live in this area. Overnight in Kohima. Day 14: Kohima/Nameri National Park. 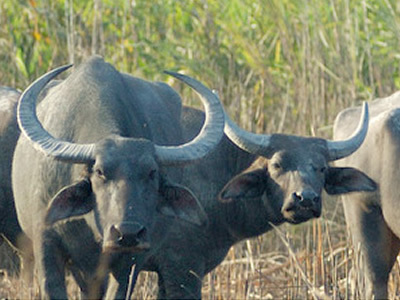 Full day drive to Nameri National Park and check in at the Eco Camp on the fringes of the National Park. 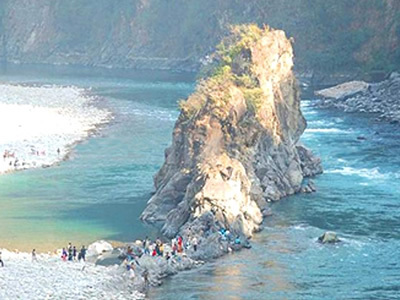 Nameri is located on the banks of the River Bhorelli on the northern side of the Brahmaputra. Situated in the foothills of the Himalayas, this is tiger and bison country! 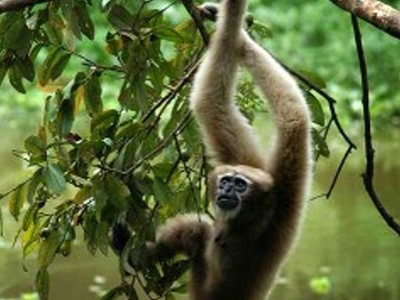 Full day to explore the park with morning and evening jeep safaris. Overnight in Nameri. Drive 5 hours to Guwahati for afternoon flight to Delhi.